(C.I.C.) Memorial Hut, Ben Nevis. One of our favourite low-level walks is to follow the Allt a’ Mhuillin path up to the CIC hut, which nestles in the shadows of the north face of Ben Nevis. We start the walk from The North Face car park, near Torlundy and follow the mountain path as it heads up into the corrie beneath the magnificent North Face of Ben Nevis. This is not a technical route, though you do need to be adequately prepared for a day out in the Scottish hills, especially in winter, with suitable footwear and clothing. On a good day, this walk will provide you with some of Scotland’s most stunning mountain scenery! For those looking for a more challenging walk the C.I.C is the highest mountain hut in the British Isles, 680m above sea level, based at the foot of the North Face of Ben Nevis. Please note it is a private and locked mountain hut for mountaineers, owned by the Scottish Mountaineering Club so no facilities are available. The hut was erected in 1928 by Dr and Mrs Inglis Clark in memory of their son Charles Inglis Clark who was killed in action in the 1914-1918 war. The original building was extensively refurbished and extended between 2008 and 2012. Please respect the privacy of those staying at the hut. The hut stands at the foot of Tower Ridge, a classic mountaineering route for those with the climbing skills and equipment. The focal point of this out and back walk to the CIC Hut is viewing the extraordinary North Face of Ben Nevis, its cliffs rising some 700 metres towards the summit. A breathtaking view not seen by walkers who ascend the summit of Ben Nevis from Glen Nevis by the Mountain Track, also known as the Pony Track and Tourist Path locally. 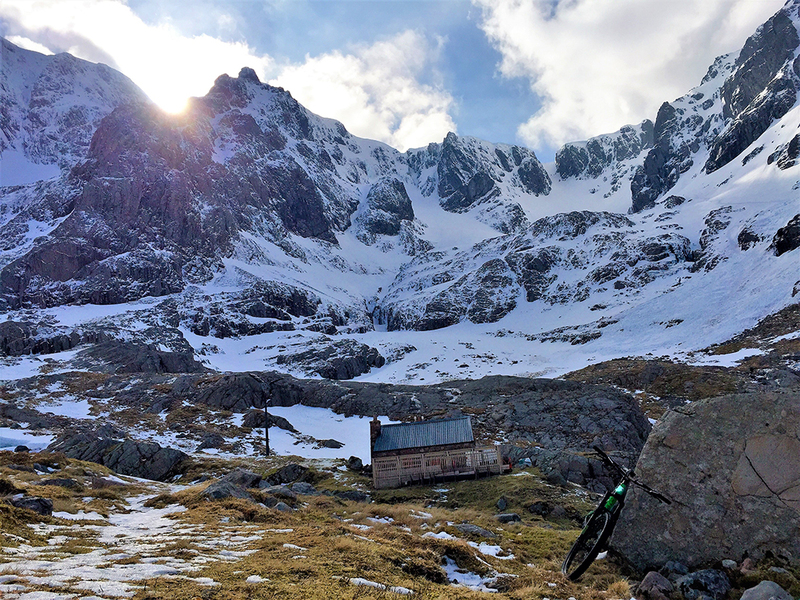 It is possible to walk a short distance beyond the hut up into the bowl of Coire Leis, giving changing views on the spectacular cliffs of the North Face. With binoculars it is often possible to watch climbers making ascents of the countless mountaineering routes. From the North Face car park to walk to the CIC Hut, it can take over 2 hours if you’re relatively fit. So out and back it can be a full days adventure, so care should be taken in winter with shorter daylight hours. Ensure you’re properly equipped for a mountain walk including head torches if you get caught out and it becomes dark.